Rumor has it that Christmas is coming soon, and perhaps no other season is infused with as many longstanding traditions! Of course, longstanding traditions are made to be broken. After all, Christmas is a very popular occasion, but not everyone believes in Santa Claus. For those who—for whatever reason—need or just want to make changes to the ages-old holiday routine, the Rituals Committee of Congregation Sons of God offers these suggestions. Buy all means, feel free to mix and/or match… and enjoy! Of course the ornament-festooned evergreen isn’t the only important piece of traditional holiday greenery—there’s mistletoe, too! “Mistletoe” is the common name for many obligate hemiparasitic plants in the order Santalales, which everyone knows… but did you know that mistletoe is toxic to humans? Well, it might be! Where, when, why, and how exactly the tradition of hanging sprigs of the stuff in doorways and encouraging people to kiss under them started is unclear, but in any case, if you’re looking for an alternative to brighten up your home and turn up the heat, maybe use something with authentic origins in the Bible itself: burning brambles! And burning brambles clean up after themselves! Christmas isn’t just for drinking, though. There’s a feast to be enjoyed, too, and the traditional holiday feast features any or all of several different kinds of animal flesh, from the Christmas goose to the Christmas ham to Christmas fish dishes, even! If you’re feeling particularly adventurous or contrary this year, you might serve none of these… but if you’d like to serve the usual subjects, only in a non-traditional manner, change things up by borrowing recipes from other cultures. The Chinese, for instance, do some very tasty things with poultry, pork, and sea creatures. “Chinese food on Christmas Eve?” you ask. Well, why not? 33 million Chinese Christians can’t be wrong! Finally, there’s the question of just how long your Christmas celebration should last. For many, Christmas is a one-day-plus affair, starting on the night (or “eve”) of December 24th and continuing the whole of the 25th. Some, though, observe twelve days of Christmas. If one day isn’t quite enough for you, but twelve days is too many, there’s nothing wrong with a compromise. You might choose to celebrate for six days, or seven, or eight. Indeed, eight days somehow seems just right for a wintertime religious holiday. And, that said, we sincerely hope you’ll enjoy yours, whatever spin you choose to put on it! Speaking of things to spin… ah, but that will have to wait for another column. Author of WHIMSY & SODA and TAKING IVY SERIOUSLY. Co-author of the GOVERNMENT MANUALS FOR NEW SUPERHEROES, WIZARDS, & PIRATES. Lone punman. Copywriter. Esq. lol and :). 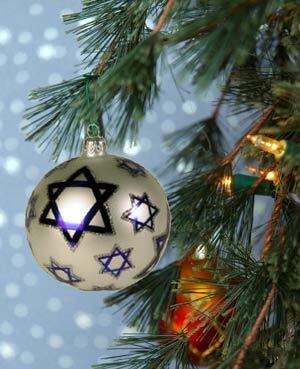 love and peace… btw- I too have a little shiksa-full on Jewish little girl. You sound like a lovely person/family. You all deserve joy, keep your memories of Noah close but enjoy making new ones with your family. I hope you had a Happy Hanukkah, (Christmas!) and New Years… it doesn’t matter that you throw in some “Christmas” you know who you are…. Thank you Stacey! Easter is coming. No spiral ham but I’m sure some plastic eggs, a hollow chocolate bunny, and some $1 bunny ears I may or may have not just purchased at Target, will make their way into our humble apartment.